I have been looking at this lens for quite a while and I finally picked it up last week from Amazon. I had heard quite a bit about this lens online and was pretty excited about giving it a try. The biggest deal about this lens is the price, mine rang up at $264 and I had a refund credit that sweetened the deal even further. If this lens seams expensive to you, then consider that the comparable Nikon lens is almost $700! The biggest difference between this lens and the Nikon is that this lens has no AE coupling or AF capability. Since this is such a wide lens, the lack of AF really isn't a big deal, just focus at around 3' and everything from 2' to infinity will be in focus. The lack of AE isn't really an issue either, this lens is very usable in M or A priority after you plug the lens into your non-cpu lens data. This is the way that I would use this lens anyway, so I don't miss what the lens lacks. This is a DX only lens, it will not cover an FX sensor. The body of the lens is made of aluminum with a similar crinkle finish that you would find on the newer Nikon pro lenses. There is a built in lens hood that is plastic, but has a matching finish. The focus ring is nice and wide, made of metal, and is covered in a nice textured rubber. The action is well damped and is probably the best of all my lenses. The aperture ring is plastic and features clicks every half stop. The optics are very good, especially considering the price. 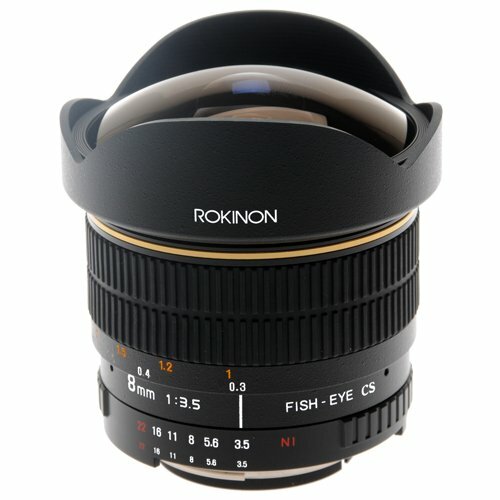 I have looked at a lot of reviews that have pointed out the optical flaws of this lens, and there are some flaws there for those who look, but nothing you won't be able to live with. Lots of people like to shoot test charts and judge a lens by the result, all I can say is good luck shooting a test chart with this lens! The good news is that this lens is plenty sharp in the middle, probably a bit softer on the edges, who cares. This is not a macro lens, it is not going to be used for document copy, it is going to be used for action sports, landscapes, creative portraits, etc. If you care there is probably some vignetting too, it would be tough to check it accurately in any case. The only real "issue" is some magenta fringing on the edges of the frame. This only really happens in areas of high contrast, say the edge of a window that is blown out, etc. It is not hugely noticeable, and totally fixable in post, but it is something to be aware of. I have only had this lens about a week, and so far I really like what I see. The quality is definitely there, both mechanically, and optically; and for the money there is definitely nothing that compares. FYI this lens is actually manufactured by a Korean company called Samyang, and they seem to be building a good reputation for solidly built MF lenses. This lens is also sold in various places under the names Bower, Rokinon, Pro Optic, and Vivitar. They all appear to be identical in design with sightly different cosmetic features. I would buy whatever you can get the best deal on, but that's just me.